As a new year begins we both look back at 2017 and look forward to the new year. During this past year, we were fortunate to have three guest speakers: Will Holcomb from Shinzo Zen Meditation Center in University City, Rev. Shoken Winecoff from Ryumonji Zen Monastery in Dorcester, Iowa, and Rev. Josho Phelan from the Chapel Hill Zen Center. We are very thankful that they took the time to offer their teachings to us. 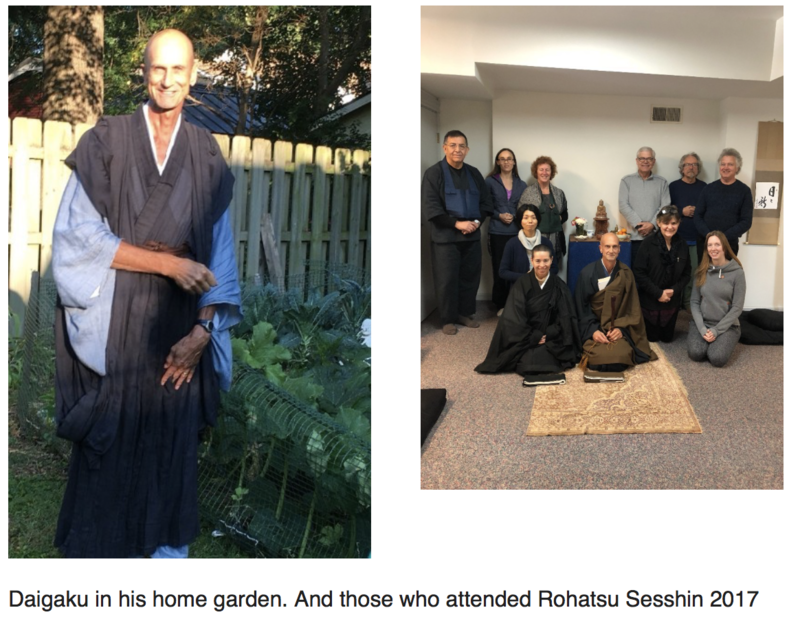 This past year, Daigaku gave talks at Webster University, University of Missouri at St. Louis (UMSL), Shinzo Zen Meditation Center, the Japan Culture Day held at the Missouri History Museum, at the Mindfulness Day event held by the Buddhist Council, as well as at Zen centers in Mexico City and Puerto Vallarta, Mexico. And of course he continues to inspire, educate, and motivate us with Dharma talks three times a month at the Confluence Zen Center. 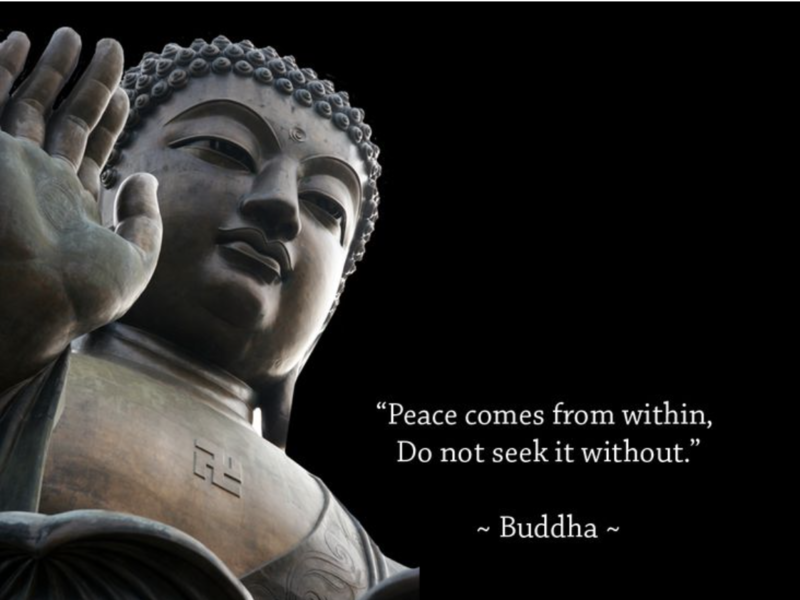 Daigaku attends the regular meetings of the Buddhist Council and is on the Board of Interfaith Partnership so that we can be a part of the larger religious community in greater St. Louis. This allows us to participate in their activities as well as to continue learning about other religions and cultures. We have signed another two year lease at our present location. We have received another grant from the Still Water Foundation for which we are very grateful. We are a small community and are still working towards self-sustainability. And with your continued support we will. Thank You! We continue to offer our volunteer services to the Japanese Festival at the Missouri Botanical Gardens in both setting up and taking down decorations and one of our members helped with reciting Japanese children’s stories. Very entertaining for adults as well! In 2017, we had professional Board Training so that our board members could learn how we could be a more effective Board and thereby meet the needs of our Sangha. We are pleased with the results of a Feng Shui consultation which a member of the Sangha offered to pay for us. The Zendo has a new arrangement which is more open and many other pleasing changes have been made as well. If you haven’t been by to see it, please do! The garage sale in the fall was a successful endeavor. We have received many books and bookcases from our members so our library is growing. As a member you can check out books. Daigaku and members continue to work hard on the garden. A new beautiful ‘wabi sabi’ wall was built on the side of the Center by two CZC members and a dedicated neighbor. Many came and participated in Rohatsu Sesshin including three people from out of state. We look forward to all that 2018 has to hold. We are grateful for all of you who have come to sit zazen, come to a class or a talk, and we hope to see you in 2018. One Day Sittings will now be held on the first Sunday of each month with the exception of September. Feb 4th and March 4th will be our next two one-day sittings. Beginner’s Night will continue to be held on the first Monday of each month at 6:30-7:45 pm. Board Meetings are held on the 3rd Friday evening of each month at 5:00 pm. All are welcome to attend board meetings. Board members only can vote. Sunday, January 28th will be our Annual Membership Meeting. It will be held at noon with a potluck lunch following. Everyone is welcome to attend! We will be voting on new Board members. Only Members will be able to vote, however. If you’re interested in getting more involved, please come to a board meeting or the Member’s meeting to see how we do it. On the third Sunday of each month we will have Work Practice following morning zazen and the sutra service. Samu (aka work practice) is another way to contribute to the Center and an excellent way to do Zazen in Activity. See the flyer below. Please email confluencezen@gmail.com to register. Daigaku will offer another series of ‘Introduction to Zen Meditation’ classes for 5 Thursday evenings at 7:00 pm from Feb 15- March 15th. The cost: $70 for the series ($35 for members). Register by calling 314-669-4465 or by email to confluencezen@gmail.com. On Sunday, February 18th we are pleased to announce that Will Holcomb from Shinzo Zen Meditation Center will be giving a Dharma talk at CZC. His talk will be at 10:30 am following the regular Sunday morning schedule. The title of his talk is” “Nine bows: a daily reminder. 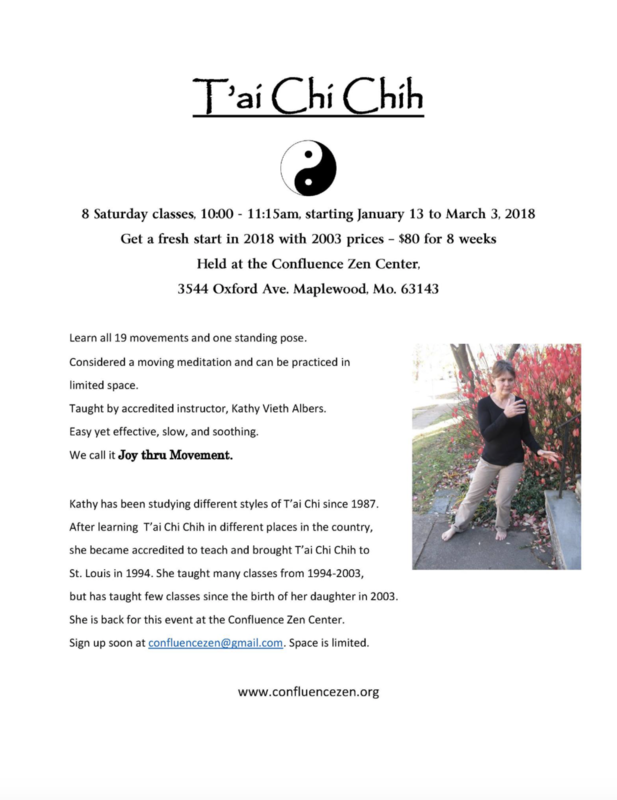 Tai Chi Chih begins Saturday, January 13 at 10:00 and will continue for eight weeks. More information about the class can be found here. Register by calling 314-669-4465 or email: confluencezen@gmail.com. Daigaku will be one of the three teachers for this sesshin, along with Rev. Dokai Georgesen (Resident priest of Hokyoji) and Rev. Reirin Gumbel, resident priest of the Milwaulkee Zen Center. Hokyoji is set among forested hills in rural Minnesota on land selected by Katagiri Roshi and originally developed by the sangha of Minnesota Zen Meditation Center. Hokyoji connects Zen practice with the experience of nature close at hand. It is located on 105 acres that include woods, meadows, a wetland, an oak savannah, a walnut grove, and more. 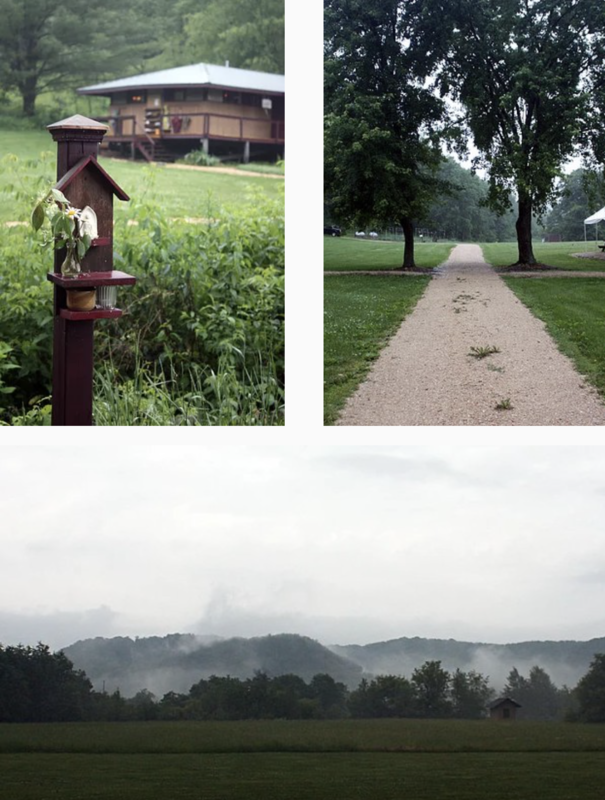 Please come enjoy the land and settle into the Buddha’s practice with us.